Chinese Animal Monkey occupies the ninth place on the 12 Sign wheel of Chinese Zodiac. Blessed with out of the box thinking and remarkable learning skills, Monkey is a smart and clever being. Traits of the Chinese Monkey are imbibed by the people born in the Year of the Monkey. Monkeys possess agile personalities and are social creatures. They love to travel in groups and enjoy being a part of the society. Monkey natives are full of zeal and invest their efforts in whatever they do. On the flip-side, once they find something boring, they quickly lose their interest in it. Monkey people have an innovative side to them. They are great at discovering new things as well. Monkey natives are known to have a great sense of humour. They are good entertainers and easily become a part of social groups without making much effort. Monkeys are cunning creatures, who twist and turn things as per their convenience. Sometimes, they act in a selfish manner. Monkey natives tend to get easily jealous in their relationships. Whatever they do out of fun is purely for fun and when they are serious about something, they do not want interference of others in it. Monkeys born during the years 1944 and 2004 are known as Wood Monkeys. The Year of the Pig will present a number of opportunities for the Wood Monkeys to select from. You can choose whatever floats your boat. As far as your career prospects are considered, the stars have got surprising gifts for you. The people born in the years 1956 and 2016 are known as Fire Monkeys. For fire is your element, you need to stir yourself up and unleash the energy that you possess. You need to give your best shot if you want to achieve the desired results. If you are born in the year 1980, you are the metal Monkey. You need to converge your energy so that you can concentrate on your goals. Decision making will be tough for you. The Metal Monkey should avoid making hasty decisions. The Monkey natives who are born in the year 1968 are known as Earth Monkeys. If you are an Earth Monkey, you should be wary of your health. Changing weather might put a strain on your health. Taking care of your health will help you to be in good kilter. Those who are born in the year 1992 come under the category of Water Monkeys. You will have a big to-do list during this year. You will try hard to tick all the checkboxes of this list. You will be self-motivated and will work hard to achieve your goals. You will have a number of responsibilities to fulfill during the Year of the Pig. The Year of the Pig will bring about a lot of opportunities for you to improve your love life, as per Chinese Horoscope 2019 predictions. The single Monkeys will have a change to mingle up. You may get connected to someone at a different level and this is when your dream love life will begin. There will be a number of promises and vows that the Monkey will loving cling onto. The Monkey is known to be passionate in relationships. Monkeys wear their heart on their sleeves but get bored with their partner easily, unless it is true love. The chances of finding your true love are exceptionally high for the Monkeys during the year 2019. The Monkey natives who are already in a relationship will develop an unbreakable bond with their partner. Arguments and disagreements are a part of every relationship and you should learn to sweep them under the carpet and move on. By doing so, you will be able to withstand the tough phases of your life with each other's love and support. The Monkey natives who are married might have it rough during this year. Therefore, you are recommended to keep a check on your words. Those who want to tie the knot may choose the Month of Monkey, Monkey, Dragon or Rat to get married. The Month of the Tiger should be avoided to walk down the aisle. The birth of a Pig child for Monkey will be auspicious. Such a child will bring happiness in the life of the Monkey parent. The Monkey natives will do great in the field of their career. They will be able to garner respect and praise for being skilled in their domain. Their competitors will be astonished to witness their progress at such an alarming rate. The Monkeys who are sick of being unemployed will be able to grab a good job of their choice. They will be paid well. The job that the freshers choose for giving a kickstart to their career should be a good one. Taking up any job that doesn't suit your requirements will eventually end up blowing in your face. Giving a solid foundation to your career is the best choice that you should opt as of now. Some people belonging to the Zodiac Sign will think about bringing a change in their career. Shifting your focus from job to business or vice versa is likely. Some of you may also start a side-business. Entrepreneurs will get the chance to give a shot to their innovative ideas and shape them into reality. As far as financial sources are considered, Chinese Horoscope 2019 predicts that you will receive income from multiple sources. When the inflow of income is good, you should think about investing it in order to gain more from it. However, weigh the pros and cons well before you invest in such a scheme. You will do great if you are associated with food and related industries. If you get a promotion that you are skeptical about, you should stick to your existing post. Do not fall the victim to dubious and fraudulent activities. The Monkeys are social creatures and so are the natives born under the Chinese Zodiac Sign of Monkeys. They enjoy the company of their near and dear ones. However, during the Year of the Pig, the Monkey will find peace in his own company. The natives of the Monkey Zodiac Sign will love to spend some time alone during which they will reflect back on their previous deeds and feel connected to their own soul. They will get involved in self-exploring themselves and will be eventually able to create a better version of their own selves.During this stretch of time, they will discover their spiritual side and will get inclined towards spiritualism. However, it is advised that you do not forget to spend time with your family members if you do not want to sour your relationship. As far as professional relationships are concerned, you will have jealous and competitive people all around you. You should not let them give the chance if tarnishing your reputation. They will try to lay down obstructions on your way to success. You should learn to overcome your problems by yourself. People will not come to your help everytime you are in trouble. Thus, you need to prepare yourself to tackle difficult situations. The lifestyle of a Monkey will be a casual one in the Year 2019. Filled with energy, the Monkey natives stand out in the crowd. They will love to enjoy the limelight that they get as a result of their activities. The Monkey will enjoy the benefits that the Year of the Pig brings with it. The Monkey people will realise that it is better to have a lesser number of true friends than having a bunch of fake ones. As a result, Monkey natives will sway away from people whom they do not trust. The Monkey natives will learn a lot and implement what they learn in the Year 2019. Chinese Horoscope 2019 predictions suggest that you must avoid procrastinating and doing things at the last moment. Try to complete your work within deadlines. Make a schedule for everything and take out some time to spend with your family and friends. Otherwise, there are chances that your kin can feel neglected. You may have the urge to make money and get profits for yourself even if it means involving yourself in immoral and unethical deeds. This should be avoided otherwise you may end up getting caught in legal issues. It is better for you to keep such problems at an arm's length because once you get trapped in this whirlpool, it will not be an easy task to deal with. During the Year of the Pig, the health of the Monkey should be paid attention to. There will be frequent ups and downs in your health. You should not be nonchalant about your health, otherwise, you will have to repent it later. Though you will be packed with energy during this year, wasting it is definitely not a good idea that you should stick to. Exhausting yourself will do not good to you. It is important that you maintain a good health during this year so that you can start the next cycle of the Chinese Zodiac in pink health. Adhering to a proper exercise regime will be good for you. Adequate meals must be taken by you to fulfill the nutritional requirements of your body. Proper sleep is necessary for you as you will spend a lot of energy and thus, recharging your body with sleep is a must. Tension and stress might lead to insomnia. Avoid stressing yourself over trivial matters. Perform meditation to achieve mental peace. The Monkey natives should be careful during weather changes. Also, you need to be cautious while driving because there are chances of accidents. “Prevention is better than cure”- is a phrase that you should always remember. In the Year of the Pig, the Monkey natives will be blessed with the energy that if channelised in the right direction can do wonders in their life. Overexerting yourself should be avoided and overthink should be kept at bay as well. The damages done in the life of the Monkey natives in the Year of the Dog can be reversed if tried. The Monkeys who have got a heartbreak will rise above it and proceed in their life, wearing their scars as a sign of the lessons that they have learnt. New relationships should be developed in a gradual manner. Make sure that you understand your partner and value them before taking the vows of marriage with them. Expenses must be carefully planned and any unnecessary expenditures must be cut off. In case of abundance of money, investing it seems to be the best option for you. Keeping some extra money with you for unexpected requirements is a good idea. The beginning of the Year of the Pig will bring about some good news related to the love life of Monkey natives. The Monkeys have a thirst for knowledge and they are very quick to learn new things. The contact list of the Monkeys will be updated because if addition of new friends and deletion of some fake ones. The year looks promising for the Monkey if the Monkey does not fall the victim to his own ego. 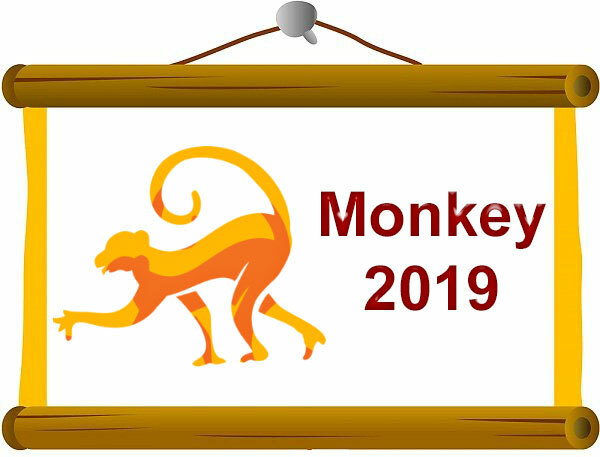 The month of April, May, and August will be the most auspicious time for the Monkey natives in 2019. However the month of February might not pan out to be favourable for Monkeys.